Originally uploaded by Adrian P.
When I saw this view from the sidewalk on South Lumpkin Street, I had the strong impression that Athens was some kind of alpine wonderland. From this angle, it looks like the Bank of America building and University Tower are perched on a mountain. 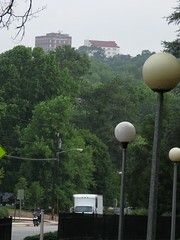 Downtown is built on a hill, and looking across this valley and Tanyard Branch really shows some of the topographical dimensions. Just moved to a very flat Illinois and miss Athen's hills like crazy!